Unique Bella was a 2-5 favorite on the morning line and 1-10 when the gates opened for Sunday’s Grade I $300,000 Clement L. Hirsch Stakes. And the 4-year-old champion filly lived up to those expectations despite losing a shoe the first time past the wire in the 1 1/16-mile event, despite feeling some competitive heat in the stretch from runner-up LaForce as a four-length lead at the top of the stretch dwindled to a half-length at the finish. Clearly it wasn’t Unique Bella’s best race, and jockey Mike Smith said so. But as a “Win and You’re In” qualifier for the $2 million Breeders’ Cup Distaff in November at Churchill Downs, it served its purpose. And when the details came out, it evidenced the worthiness of the daughter of Tapit, owned by the Don Alberto Stable of Fernando Diaz Valdes of Lexington, Ky., and trained by Jerry Hollendorfer, having her name on a list of Hirsch champions with Azeri, Zenyatta, Beholder and Stellar Wind. “She must have turned her (left front) foot a little and stepped on it (right front) coming out of the gate,” Hollendorfer assistant Dan Ward said Wednesday morning. On Ward’s cell phone was one of the many images capturing the dangling or falling shoe that hit the internet. Unique Bella was comfortable in her outdoor pen Wednesday morning. She’s likely to do some light training at Del Mar over the remaining five weeks of the meeting, but her next start will likely be at Santa Anita in the fall. Lava Man, the 2006 TVG Pacific Classic winner who was back for the first time at Del Mar as a stable pony in the barn of trainer Doug O’Neill, underwent successful surgery on Tuesday at the San Luis Rey Downs Equine Hospital and is well on the road to recovery. O’Neill said the now 17-year-old horse, a $50,000 claim at Del Mar in 2004 who went on to earn $5,170,103 – the most ever by a horse following a claim – will soon be headed to a farm to complete recovery, although the farm has yet to be determined. Entries will close and post positions were drawn later Wednesday for Saturday’s Grade II $200,000 Yellow Ribbon Stakes while Thursday is the deadline for entries and draw for Sunday’s Grade III $150,000 La Jolla Handicap and Grade II $200,000 Sorrento Stakes. Racing officials listed the following nominated horses, in alphabetical order, as possibles or probables for the races. Yellow Ribbon – Ancient Secret (trainer Phil D’Amato), Beau Recall (Simon Callaghan), Cambodia (Tom Proctor), Hallie Belle (Michael Stidham), Madame Stripes (Neil Drysdale), Pantsonfire (Richard Baltas), Queen Blossom (Richard Baltas), Sassy Little Lila (Richard Mandella), Sophie P (Jim Cassidy), Storm the Hill (Phil D’Amato), Tisbutadream (Ben Cecil) and Vasilika (Jerry Hollendorfer). La Jolla – Afleet Ascent (Jerry Hollendorfer), Arawak (Doug O’Neill), Blame the Rider (Doug O’Neill), Californiagoldrush (Neil Drysdale), Desert Stone (Richard Baltas), Move Over (John Sadler), Restrainedvengence (Val Brinkerhoff) and River Boyne (Jeff Mullins). 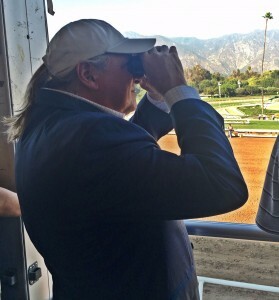 Sorrento – Der Lu (Bob Baffert), Dichotomy (Doug O’Neill), Dragic (Wesley Ward), Katieleigh (Kathy Ritvo), Lady Lucy (Phil D’Amato), Madison’s Quarters (Ian Wilkes), Reflect (J. Keith Desormeaux), Stirred (Michael McCarthy), Summerland (Philip Hall) and True Validity (Simon Callaghan). When Mike Moran was informed by his longtime friend, bloodstock agent Nick Hines, that he had just purchased a horse for him at the Keeneland September Sale in 2016 for $1,700, the veteran of more than 20 years of racehorse ownership had a question. “I asked him ‘Does this horse have polio?’” Moran said recently. Many longtime racing followers were unaware that the gavel could fall on any thoroughbred for that low a price at one of the most prestigious sales in the country. So Moran’s concern about the animal’s health, even in jest, was understandable. But there was the now 3-year-old California-bred son of Slew’s Tiznow going wire to wire in a 2 ½-length score under Rafael Bejarano a week ago (Wednesday, July 25) to break his maiden in his second start, the first being a runner-up in June at Golden Gate Fields, to increase his career earnings to $20,000, or nearly 12 times the purchase price. The name, Moran said, was inspired from the dam-side pedigree. Carson’s Dane is a Carson City mare. Carson City in frontier times was the general location of the TV series “Bonanza” about rancher Ben Cartwright and his sons, among them big, easy-going and lovable “Hoss,” played by Dan Blocker. “I can’t tell you how many people have called or come up to me and said that’s a great name,” Moran said. Hoss Cartwright is trained by Andy Mathis, who confesses to be as surprised as anyone about the $1,700 bargain. Monday morning, two days after being paraded here in his last racetrack experience, trainer Bob Baffert brought Triple Crown winner out for pictures and poses with a sizeable group of fans, followers and photographers. At around midnight Wednesday morning, a van carrying Justify, accompanied by Baffert assistant Jim Barnes, departed the Del Mar stable area for Ontario airport and a 2 a.m flight to Kentucky and WinStar Farm where Justify will begin retirement and an eventual career at stud. Joe Talamo was accorded individual honors but the overall winner was the Permanently Disabled Jockeys Fund during a jockey Karaoke contest Sunday night at the Belly Up Tavern in Solana Beach. Talamo was the winner over Mike Smith, Gary Stevens and Rafael Bejarano and others in a decision rendered by the panel of judges – Del Mar Thoroughbred Club CEO Joe Harper, trainer Doug O’Neill, bloodstock agent Nick Cosato and sports talk radio host Scott Kaplan as $50,000 was raised for the PDJF. A similar event was held at Saratoga on Monday. CLOSERS – Joel Rosario, now New York-based but a three-time Del Mar jockey champion (2009-11), has been chosen to ride Accelerate in the $1 million TVG Pacific Classic on August 18. “Just my call,” trainer John Sadler said Wednesday morning. “We have a good history together and he’s one of the top riders in the country.” The mount on Accelerate came open when jockey Victor Espinoza fractured a vertebra in his neck 10 days ago in a training hours spill. Hospitalized through much of last week and in a rehabilitation facility since then, Hall of Fame rider Espinoza is expected to be released to his San Diego home on Thursday, his agent, Brian Beach, said. Espinoza will be wearing a neck brace for several weeks and will not return for the rest of the season … My Boy Jack, nominated to Sunday’s La Jolla Handicap, is out for the year with a bone chip in an ankle that will require surgery. A three-time stakes winner, the colt was fifth in the Kentucky Derby and eighth of nine in the Grade I Belmont Derby on July 7, after which the injury was detected … Paradise Woods, the 4-year-old stakes-winning filly owned by Rancho Santa Fe’s Pam and Marty Wygod and Herman Sarkowsky, will be sidelined for a few months due to bone bruising detected Friday. The winner of the Grade I Santa Anita Oaks and Grade I Zenyatta in 2017 was 0-for-3 in 2018 and finished sixth as the 2-1 favorite in the Osunitas Stakes here on July 20 in her first start on turf … The inner rail on the turf course was moved out to its 24-foot position. … Selected works from 314 officially timed over the last three mornings: Monday – Eskino Roses (4f, :47.60); Tuesday – Dr. Dorr (4f, :49.00), Isotherm (4f, :50.80), Mubtaahij (4f, :49.00), Offshore (4f, :52.20), Amboseli 5f, 1:02.00), Morse Code (6f, 1:11.60); Wednesday – McKinzie (3f, :37.60), Operandi (4f, :47.80), Abel Tasman (5f, 1:01.40), Battle of Midway (5f, :59.80), Marley’s Freedom (5f, 1:01.40), Vale Dori (5f, 1:01.40).